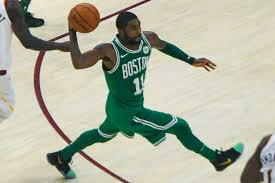 Celtics guard Kyrie Irving, was fined $25,000 by the NBA for throwing a basketball into the stands after losing to the Denver Nuggets Monday night. His frustration was sparked by the Nuggets Jamal Murray, who had 48 points and heaved a 3 pointer at he buzzer in an effort to eclipse the 50 point mark in Denver’s 115-107 win. Irving claimed Murray’s 3-point attempt was a cheap shot. “You don’t wait ’til the end of the game, when everybody’s not playing, to just launch up a shot,” said a frustrated Irving. He said he felt disrespected by the 21-year-old who took advantage of the final seconds of the game to boost his stats.